At Anabranch Solutions, we strive to develop, implement, test and promote efficient watershed and stream restoration approaches that can actually scale to the scope of degradation. We seek to build partnerships with both the people and the systems we work in, such that we increase the odds that the solution will be self-sustained by the system itself (i.e. 'let the river...' or rodent 'do the work'). We imagine riverscapes that were once (in 2010's) degraded and vulnerable, transformed into healthy and thriving ecosystems, through simple, cost-effective, low-tech process-based restoration actions that kickstarted recovery and self-sustaining fluvial and ecological processes. Once these processes were set in motion (e.g. successful reintroduction of beaver to appropriate areas), the footprint of the recovery spreads well beyond the footprint of the restoration actions. 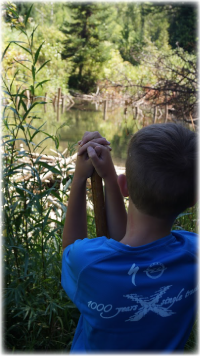 Luke Wheaton (Age 8 in Photo) looking at the remodelling beaver had done to a beaver dam analogue he helped build. Through partnerships with our clients, help trial, spread and fully implement well thought out 'cheap and cheerful' restoration projects in Western States. Discover and spread the adoption of as many new low-tech PBR solutions as possible and implement pilot projects and demonstration projects across the full diversity of physiographic settings in which we work. Directly be involved in design and restoration of dozens of projects spanning 100's of miles of streams, building > 10,000 structures and share what we learn (successes and failures) with others. Support and influence agencies, watershed councils, tribes, landowners and stewards of riverscapes to help give them the tools and the confidence to tackle 100's of pilot projects and make the transition to full-scale implementation projects (e.g. 10's to 100's of miles). Helped change the way restoration practitioners think about restoration throughout the world, and instill a 'cheap and cheerful' ethos. This is not just about littering streams with low-tech, hand-built structures. Rather, this is about getting practitioners to think about what they're really trying to achieve and using those limited and precious restoration dollars as wisely as possible to extend their impact as far as possible (i.e. PBR light). Directly be involved in design and restoration of 100's of projects spanning 1000's of miles of streams. Support others in design and restoration of 1000's of projects spanning tens of 1000's of miles of streams. Be able to rigorously document, and publish in peer-reviewed scientific literature the positive impact (and any unforeseen consequences) of above restoration actions on target populations and ecosystems of management concern. Take great care of our employees and create an inspiring and supportive environment to work in that fosters creativity, diversity and innovation. We will invest back in the communities and causes we care about through volunteer work, subsidizing projects and efforts we can, and investing in research & development that can yield scientific results that can inform and improve policy, planning and practice in restoration and conservation.